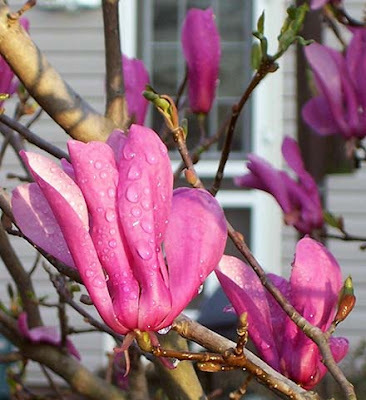 The dew on these Japanese Magnolias reminds me of some precious tears and a passage that means the world to me personally, as I am that woman. 'A moneylender had two debtors: one owed five hundred denarii, and the other fifty. Turning toward the woman, He said to Simon, 'Do you see this woman? I entered your house; you gave Me no water for My feet, but she has wet My feet with her tears and wiped them with her hair. 'You gave Me no kiss; but she, since the time I came in, has not ceased to kiss My feet. 'You did not anoint My head with oil, but she anointed My feet with perfume. Each of us who have given our lives to Jesus as our Lord and Savior have a testimony (story) of that event. They aren't all the same, but the same elements must be there. A broken heart convicted of it's sin and lost condition. Repentance - a conscious renouncing of all things in our lives that don't line up with God's will and His Word (the Bible), and a commitment to turn from those things and live the rest of our lives in obedience to His Word as our Savior, Lord and Master. Belief that He is indeed the only begotten Son of the Living God. Asking Jesus to be our Savior and forgive all our sins. Continuing to obey His Word by being immersed in water baptism in the name of the Father, the Son and the Holy Spirit. All this can be done at one time. Think back. If your "salvation experience" does not contain these elements, you might seek God deeply in prayer to see if you are truly saved after all or if someone just lead you in a "magic prayer" that you repeated. A "magic prayer" does not save us no matter who tells you so. The Bible makes it clear that salvation is with all our hearts, souls and minds involved or it is not salvation. It terrifies me to think of how many people have been deceived into thinking their eternity is secured when all they did was parrot a magic prayer with their mouths. Remember, God judges hearts. Empty words are worthless and powerless. Let's be sure of our salvation right now. There is nothing more important you have to do right now. More pretty spring flowers for you! 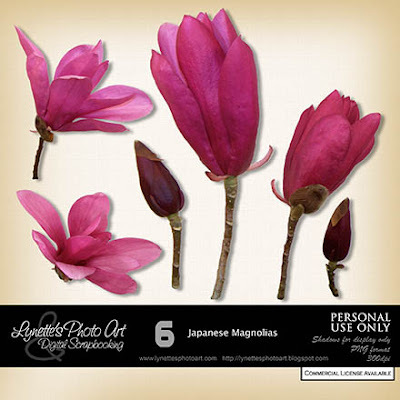 This is a Japanese Magnolia. Thank you! Your blog post will be advertised on the DigiFree Digital Scrapbooking Freebie search engine today (look for timestamp: 09 Apr [LA 07:00pm, NY 09:00pm] - 10 Apr [UK 02:00am, OZ 12:00pm] ). I've been looking also to the pictures of Winnie and Boo with SO much delight !! Thank you so much for this Freebie. I want to let you know that I posted a link to your blog in Creative Busy Hands Scrapbook Freebies Search List, under the Elements Only, Papers Only post on Apr. 10, 2009. Thanks again. I've never been to your blog before. Can't wait to check it out. The flower is beautiful. Thank you.